The Asian crisis and the problems in many transition economies, especially Russia, have brought to the surface a number of issues that implicitly or explicitly involve addressing one of these two questions: Is economic development feasible for some countries? Or its variant: Under what circumstances is economic development feasible for some countries? Over the last thirty years the rapid growth of Asian countries has played a critical role in shaping thinking about development by academicians as well as policy makers. For, they have provided real world examples that can be used to argue that development is feasible regardless of initial conditions. Small countries can look at Hong Kong and Singapore; resource poor countries can look at South Korea; resource rich countries with corrupt governments can look at Indonesia, and so on. With the advent of the Asian crisis, these real world examples become less convincing and a wave of pessimism seems to be setting in about the possibilities for development. Hence, the importance of the questions raised above is heightened by the current economic circumstances. In this essay we examine the underlying rationale for various arguments about the possibilities or lack of possibilities for development put forth in the literature. Anticipating somewhat, one of our conclusions will be that the rosy view before the crisis was as unfounded in logic as the more pessimistic view emerging from the current crisis. Finally, we will draw the implications of our arguments for Cuba’s economic prospects. Answering either of the questions raised above requires a clear statement of what one views as economic development. We use as our point of departure the following view, Betancourt (1996): economic development is a process or set of processes whereby a society consistently increases the standard of living of the majority of its population. The two italicized items stress key features of the definition which can be the source of differences in evaluations of any real world experience. A restrictive definition of the standard of living would be the level of material well being of an individual viewed as his or her capability to acquire material goods, measured for example by the level of income. This definition seems to be the one most widely used by economists and policy makers in governments and international organizations such as the IMF or the World Bank, Anand and Ravallion (1993). An encompassing definition of the standard of living would be one that would include, in addition to material well being, an individual’s capabilities in three other dimensions: education, health, and control over one’s life through the ability to participate in civic and political activities. This encompassing view of the standard of living has been advanced, for example, by Sen (1987) and Dasgupta (1993). It provides the intellectual basis for measures such as the human development index put out by the United Nations, although it does not justify the particular form adopted in that index. While the encompassing definition is more attractive, it is also more difficult to conceptualize and measure accurately and reliably. This hinders its use in formal models and in empirical analyses. We will keep the more encompassing definition of the standard of living in the background but we will follow the literature and focus on the restrictive definition unless stated otherwise. A second source of potential differences in view attaches to the meaning of the word consistently. It has long been recognized that any country can experience rapid growth in per capita income for some period of time without experiencing development in the sense of acquiring the capability for self-sustaining growth. Rostow’s (1960) definition based on the choice of a ten year period for his take-off into self sustained growth was not successful. By his definition, there are too many crash landings after take-off. One aspect of consistency is duration. The longer a growth episode continues the more likely we have development rather than just growth. By choosing a long period, for example half centuries, we have a better proxy for self-sustaining growth. This allows for countries, for example Argentina in the late nineteenth century and early twentieth century, that crash landed after a considerably longer period of growth than ten years. Other examples of several decades of growth followed by similar crash landings are Cuba in the late eighteenth century and early nineteenth century and Venezuela in this century. These historical experiences would suggests that duration of growth over a number of decades is necessary for duration to be a good proxy for sel-sustaining growth—in the sense that the processes determining the operation of a particular society allow it to increase consistently the per capita income level of the majority of its population. Another complementary dimension of consistency is instability or variability. A recent paper by Pritchett (1998) allows us to look at this dimension somewhat systematically. He classifies countries into developed and less developed by using membership in the OECD (prior to the recent additions), adding Malta and Cyprus to the developed category and subtracting Turkey from this category. Starting in 1960 and using all the data available since then until the most recently available year, he calculates growth rates in GDP per capita in terms of (1985) purchasing power for 111 countries. He discusses three dimensions of these growth rates for the two groups of countries: trend, instability and volatility. For our purposes, it will suffice to consider just the first two dimensions.3 Table 1 summarizes his results in these two dimensions. The mean and standard deviation (S.D.) of the trend growth rate is the result of estimating the trend growth rate for each country by regressing the logarithm of income on a linear time trend via ordinary least squares and then obtaining the average and standard deviation of this estimate for the countries in the group. The mean and S.D. of the R-Squared of trend is obtained by calculating the average and standard deviations of the R-Squared in the regression estimating the trend growth rate for each country over the countries in the group. The trend growth rate results require little explanation; they suggest that the average growth rate is higher (and has a lower standard deviation) in developed countries. The R-Squared of trend results would be less familiar. The R-Squared of trend is a measure of how well a time trend explains the growth experience of a country. For developed countries, fitting an exponential time trend explains most of the variation in per capita income; all R-Squared’s are between .9 and 1. For developing countries, however, the time trend is not as powerful in explaining the variations in per capita income; the R-Squared ranges from 0 to 1. Thus growth rates in developing countries are far less stable than in developed ones, which is one of the main points Pritchett (1998) emphasizes. In order to increase consistently the standard of living of the majority of the population, a country must not only experience growth over several decades but do so with a limited amount of instability. Circumstances can change dramatically and the ability to adjust to these changes in circumstances without jeopardizing the standard of living of the majority of its population is what characterizes the processes at work in a developed society. With any degree of risk aversion, welfare is decreased by this instability in growth rates, other things equal. Note the perspective this provides on the Asian crisis. Since some countries in Asia that have grown over thirty years may resume growth quickly and others may not, the former could be viewed as having entered a period of development in the precrisis years and the others as having enjoyed a period of growth in the precrisis years (just as the historical examples cited above). Note also that this view of development allows for societies to move between categories in both directions, depending on their performance. One of the two main conclusions of Pritchett’s analysis is that growth regressions have exhausted their usefulness, but they have taught us that there are three antigrowth syndromes: severe economic imbalances or macroeconomic instability, excessive inward orientation, and state led development by a nondevelopmental state. The other main conclusion is that to make further progress one needs to analyze: what leads to initiation or cessation of growth episodes; how the determinants of growth evolve in particular circumstances; and, finally, the determinants of changes in growth rates over time. In other words, we need to understand the characteristics of development processes that lead to inconsistent increases in per capita income for developing countries (and consistent increases in developed ones) in order to answer the question of under what conditions is development feasible. To this task we now turn. Perhaps the earliest development literature addressing these issues is the literature on export-led development. Part of it focused on the successful entry into the developed group of the so-called newly settled regions while part of it focused on the reasons why many developing countries did not follow suit despite similar export booms during the same historical period, namely the nineteenth century and early twentieth century. The nature of production processes and the linkages they generated to other industries in terms of inputs and outputs, including social overhead capital and entrepreneurship, were viewed as critical determinants of whether an export boom led to development or not. By now these views have filtered down to the undergraduate textbook level, e.g., Gillis, Perkins, Roemer and Snodgrass (1996), where they are usually accompanied by an optimistic outlook. That is, even in the worst of cases in terms of poor linkages of the industry experiencing the boom, it is argued that government policy via fiscal linkages can be used to address the perceived problems and promote development over the long-term. Since in the nineteenth and early twentieth century governments did not act as developmental states (in fact some of the developing countries experiencing the export boom were colonies), one can explain why countries with unfavorable linkages due to the nature of their production processes failed to develop then but need not fail to develop now. A similar view arises from the more recent literature on export-led growth focusing on Dutch Disease, or the inflationary boom and real appreciation of the exchange rate that afflicts natural resource based export- led booms. In these cases, which have also reached the undergraduate textbook level, it is argued that economic policy can prevent the undesirable consequences of the boom. Ironically, prior to the recent crisis Indonesia was cited as an example of a country that had ben able to avoid Dutch Disease through their judicious macroeconomic policy. Recent events in Indonesia show that a judicious macroeconomic policy, while it may be able to avoid Dutch Disease, is not a sufficient condition for development in terms of consistently increasing the standard of living of the majority of its population. A new more pessimistic view of export-led development in resource-rich countries is now emerging from the most recent literature. This literature starts from a negative correlation between the share of exports of primary products in 1970 and the average growth rate of GDP between 1970 and 1989, Sachs and Warner (1995). Since this correlation seems robust to the inclusion of additional variables as well as to the use of alternative measures of resource endowments, the search for explanations is gathering steam. Rodríguez and Sachs (1998), for example, argue that resource rich economies have lower growth rates because they are likely to be living beyond their means. To support their argument empirically, they point out that if one tries to explain the level of income rather than its rate of growth the share of exports of primary products comes up with a positive coefficient rather than a negative one. To support their argument theoretically, they put forth a growth model in which the output of one sector (the natural resource sector) is fixed to capture the fact that the natural resource is depleted over time. In the steady state, production of the natural resource tends to zero. During the transition state, however, the natural resource allows the economy unusual consumption opportunities, which lead to overshooting or approaching the steady state from above.4 In their view, the development of the Venezuelan economy since the beginning of the oil industry take-off in 1914 led to a situation in which by 1970 this country was already overshooting its steady state in terms of both production and consumption, and it is quite consistent with the lower growth rates observed since 1970 and the implications of their model. This explanation, however, requires the inability of the natural resource economy to invest its resource windfall in international assets. They provide three reasons why this restriction may apply: internal political restrictions, lower or declining expected rates of return in international capital markets, or a preference for holding home assets. The second reason seems contrary to fact and there is little evidence for the third one in case of Venezuela. While the first one may have had some validity in the past, it is certainly not immutable. If correct, this explanation does suggest that one of the characteristics of the development process entails directing the collective will of the society toward the pursuit of economic betterment for the majority of its citizens. Moreover, it also suggests that having the outward trappings of a democracy for forty years is neither necessary nor sufficient to guarantee that a society is indeed pursuing this goal, since Venezuela would rank high among developing countries in standard measures of democracy such as the holding of elections. An alternative explanation of the negative correlation between natural resources and growth is put forth by Asea and Lahiri (1998). They develop a two-sector endogenous growth model in which human capital is the engine of growth. One sector produces output essentially with a fixed endowment of a natural resource and unskilled labor. The other produces output with a fixed factor, the accumulated stock of human capital, and the average per capita human capital stock. If unskilled labor and the natural resource are complementary factors of production, then the steady state growth rate of the economy is decreasing in the level of the natural resource and the price of the natural resource. The mechanism bringing this about is that these two exogenous factors increase the opportunity cost of human capital accumulation and this decreases the level of schooling which is the engine of growth in the model. A simple empirical test shows that human capital, measured in terms of secondary school enrollment, loses its power in explaining growth rates between 1970 and 1989 when the share of natural resources is added to the regression as an explanatory variable. It is worth noting that the theoretical result depends on two key assumptions: a low intertemporal elasticity of substitution, which is standard, and the inability to invest abroad, which is not. A subsequent strand of development literature that sheds light on the nature of development processes is associated with the strategy of import substituting industrialization. Early arguments were based on the notion of externalities, or unpaid benefits and costs of various types accruing to third parties uninvolved in an exchange, or increasing returns at the level of the firm to argue in favor of import substitution. Underlying these arguments was the positive empirical association between the level of per capita income and the share of industry in GDP. Recent and more formal literature has stressed one form of externalities, namely complementarities so that the ranking of benefits of an agent’s action depend on the actions of other agents in the economy. Models with complementarities can generate multiple equilibria, including configurations in which every one would be better off in one equilibrium than in another but history and expectations trap the economy in the less desirable equilibrium.5 Government intervention can in principle provide a coordination mechanism that moves the economy from one equilibrium to another. In this case the issue arises of what particular form should the intervention take. With respect to complementarities and in the presence of limited resources, interventions need to account for the characteristics of backward and forward linkages affecting the structure of a particular society. Either perfect competition or an open economy, however, undermine the logic of these arguments. Thus, the role of complementarities in creating development traps has to rely on its application to the nontradable sector of the economy. Increasing returns at the firm level have been used as the basis for infant industry protection arguments for many years. In the absence of learning to produce effects, however, the logic for government intervention in the form of temporary protection is flawed. Not surprisingly, Bruton (1998) posits learning and the accumulation of knowledge as the main sources of development in his recent essay on why import substitution should be reconsidered. Increasing returns, however, have been given a new interpretation in more recent literature which views development as specialization. Since technology and globalization are changing the nature of these producer services, the assumption that they are nontradable needs very close scrutiny. Many firms provide international auditing and consulting services. The same is true for banks. The 1990s saw the move of some American retail formats (Wal-Mart) into Mexico, perhaps as a result of NAFTA. The importance of these developments is enhanced because the often intangible and intertemporal nature of the benefits to some of the parties involved in the exchange of producer services requires the presence of one of the factors Olson (IRIS Newsletter, 1998) calls market augmenting government, namely contract enforcement mechanisms. Yet, internationalization of services to circumvent the lack of existence of these contract enforcement mechanisms in some developing countries takes place with the aid of technology. The introduction of the Tran$card debit card in Cuba by a Canadian firm and its endorsement by the Association of Independent Journalists, a dissident group, is an ironically appropriate example of this possibility. Without nontradability, the development trap due to this type of increasing returns disappears. Another aspect of this type of increasing returns argument that seems overlooked is best understood by considering the reduced form production function for the increasing returns sector that emerges usually from these models: namely, S = n(1/a)h. S is the output of producer services; h is the amount of resources allocated to the production of any one type of producer services; and n is the number of different types of producer services. a is a parameter that measures the degree of substitutability between the different types of services and lies between zero and unity. The higher is a, the higher the degree of substitutability. One might argue that the higher the level of development, the higher is a. In this case, the increasing returns process gets exhausted at some point in the course of development and we would be back to a situation such as the one in the Rodríguez and Sachs model of the previous section. To conclude, both export-led processes and import substitution processes can generate growth, but their ability to generate development can be hampered by a number of circumstances. In particular if the ability to invest abroad or to draw investments from abroad is substantially limited, by whatever factors, development traps or steady states with low rates of growth can arise through a variety of different mechanisms ranging from complementarities to increasing returns to the usual diminishing returns. Until the last decade modern growth theory was based primarily on the neoclassical model of economic growth, which emphasized the importance of exogenous technological change in determining growth rates and the limits of capital accumulation in affecting growth due to diminishing returns. This raised doubts about the ability of policy to alter longrun outcomes. Moreover, growth accounting exercises based on this view provided quantitative empirical evidence confirming the importance of technological change, measured as a residual, as a determinant of growth rates and they also provided evidence that this factor was far more important in accounting for growth in developed economies than in developing ones. Extensions of the analysis to optimal growth generates similar results as long as the intertemporal utility function of the representative consumer exhibits no temporal dependence. We show in an Appendix, available from the authors on request, that a simple introduction of temporal dependence in the utility function leads to a substantial modification of the results for one of the simplest growth models that can be constructed. In particular we assume a form for the utility function that introduces what Deaton (1992) calls “habits” in the utility function. The rationale for the form is that the minimum standard of living that the representative individual perceives is a function of per capita income, more specifically it is proportional to per capita income. With this modification alone, we can generate the conclusion that the steady state level of the capital stock is inversely related to the proportionality constant; hence, so is the steady state level of per capita income. This proportionality constant would be influenced, for example, by the expectations that political leaders generate among their citizens. Thus, demagoguery by increasing this proportionality constant leads to a higher expected minimum standard of living and, thus, lowers the long-run level of per capita income in this model. Introducing exogenous technical change in the model results in this parameter affecting the steady state growth rate. One characteristic of technological change processes is what has been called creative destruction. That is, some innovations are drastic in that they eliminate completely the previous way of doing things by making them economically unattractive whereas others are nondrastic in that the old technology can survive, although at a lower level of profits than the new one. What this implies in either case is that the possibility of appropriating monopoly rents for some time is one of the driving economic forces of innovative activity and that those who may end up on the wrong side of the innovative activity at a particular point in time may have an incentive to prevent the innovation, especially in the case of drastic innovations. Incidentally, if this is one of the foundations of economic development, we should not be surprised that some individuals oppose the process although it would be surprising if they were to admit it openly. A second characteristic of technological change processes emerging from growth accounting exercises as well as historical evidence is that they seem to influence growth at varying rates across space, time and economic sectors. This suggests that technological change processes may be of more than one type, which Schumpeter argued. The more recent literature captures this feature to some extent by differentiating between processes based on horizontal differentiation or imitations, for example the increasing returns process described at the end of the previous section, and processes based on vertical differentiation (quality improvements).8 Increasing returns in the former case work by adding more sectors to the economy and any given amount of resources must be spread over more sectors, which leads to the eventual exhaustion of the process. Increasing returns in the latter case, however, allow for an economy to grow at a constant rate when the research sector uses capital as an input. In this model capital accumulation and innovations (technological change) are complementary factors in generating a steady state rate of growth of the economy, Aghion and Howitt (1998, Ch. 3). This provides a point of departure for explaining why this constant rate is higher in some countries than in others as well as why it is more stable in some countries than in others, which in turn coincides with the main features of the variations in the growth rate of output per capita identified above. A third characteristic of technological change processes is that they require resources to produce innovations. These resources take the form of physical capital and human capital. The latter in particular can also take various forms. For example, some forms of skilled labor do not require higher education but skilled workers engaged in research and development activities usually have training beyond high school.9 Thus, the complementarity between physical capital accumulation and technological change extends easily to the accumulation of human capital and is consistent with the importance of secondary school enrollments in explaining growth rates typically found in growth regressions, for example the one cited earlier when discussing export-led growth. What is different between the role of education as a characteristic of technological change processes and its role in models such as the Asea and Lahiri (1998) model discussed earlier is that human capital is an input into the production of innovations. This Schumpeterian view implies that the accumulated stock of human capital can affect the growth rate of output. Since human capital also requires human capital in its production and its acquisition is the outcome of individual choices, the incentives societies provide for its acquisition in terms of costs and benefits will be particularly important in determining its accumulation and the technological change processes that are feasible in a society. A fourth characteristic of technological change processes is that the accumulation of knowledge has both public goods and private goods characteristics. At the simplest level one can think of existing designs as public goods costlessly available and of new designs as private goods which require resources to produce and generate appropriable economic benefits. Some reflection suggests rather quickly, however, that in both cases additional considerations arise. Old designs may require adaptation to remain economically attractive. The adoption of old designs with or without adaptation may not be costless if part of the knowledge base of the design is tacit knowledge, North (1990), which requires learning by doing. The appropriability of benefits in new designs is a strong assumption, since the innovation process for any individual agent is highly uncertain because the pay-offs are in the future whereas the costs are in the present. An immediate implication of these characteristics is that institutions can play an important role in determining the technological change processes that a society adopts. One aspect of institutions is the so-called market augmenting role of government in providing contract- enforcement mechanisms mentioned earlier. In certain types of markets where transactions are highly uncertain because costs and benefits to a transaction are separate intertemporally, the nonperformance of this function can lead to the absence of the market or to much lower levels of transactions in these markets, Clague, et al. (1994) When governments do not fulfill this function, Betancourt (1998) argues that alternative institutional arrangements may arise, in particular corruption, but that these alternatives do not fulfill this function as effectively as an impartial judiciary, especially in the presence of competitive pressures. This role is nowhere more important than in markets and transactions associated with innovations. In addition to this fundamental role, the public good nature of innovations and learning by doing provide additional reasons for government interventions with subsidies or patent protection, for example. Nonetheless the capacity of governments to intervene wisely varies considerably. Hence, the quality of governance in a society will be an important factor in determining the technological processes that are feasible. A second implication of this characteristic is that the role of the international economy in the development process will be quite complex. Two effects are easy to see. In so far as participation in the international economy acts as a transmission mechanism for the diffusion of technological change processes, directly through the transmission of ideas or indirectly through the generation of spillovers, it would influence growth positively. On the other hand, if comparative advantage leads to specialization in economic activities where knowledge accumulation is not a driving force, the influence on growth will be negative. More generally, Aghion and Howitt (1998, Ch. 11) show that the rate of technological change and participation in the international economy are jointly determined. In this setting, openness need not always be beneficial to growth and they conclude their discussion by reviewing the empirical evidence, which is not overwhelmingly convincing but shows a positive association. Part of the current conventional wisdom is that the beneficial effects of participating in the international economy take place because openness increases competition. If this is the case, then the effect of participating in the international economy on growth will be influenced by the effect of competition on technological change processes. Aghion and Howitt (1998, Ch. 7) analyze the role of market structure in technological change processes. They develop a series of models that show how competition in the innovations sector as well as product market competition can increase growth. The latter effects would be particularly important for developing countries with limited or nonexistent research sectors. Aghion and Howitt identify two basic channels: If managers are agents engaging in nonprofit maximizing behavior, then competition can increase growth by forcing managers to speed-up the rate of innovation; it can also increase growth by providing incentives for resources to move toward research activities within firms operating in product markets, including intermediate product markets. Summing up, economic development in the tropics or elsewhere is feasible, but it is not easy. It requires the participation of most citizens in a country on both the production side and the consumption side. The effectiveness of this participation on the production side depends on a number of factors that are not trivial to bring about, because they depend on what human beings do and want as both individuals and members of a society. Among the most important of these factors are: high levels of education, broadly defined, among the citizenry, i.e., including business and entrepreneurial skills; institutions that provide incentives to innovative activity (in the innovations sector as well as in product markets); and, institutions that provide incentives for the body politic to focus on the betterment of the economic condition of most of its citizens in terms of actions rather than words. While the above factors may not be all that controversial as a strategy to pursue, their tactical application in any one setting can generate more debate. For instance, Rodrik (1998) argues that some countries may be better off by slowing down their participation in the globalization process. Why? Because the world market is as much a source of disruption and upheaval as of opportunity for profit and growth and, according to him, having the “right” institutions at home is necessary to take advantage of the latter while mitigating the consequences of the former. To illustrate his point, Russia over the last few years has had a government with minimal ability to collect taxes, pay its debts or even provide money as a medium of exchange for the productive activities of its economic agents. The concurrent globalization of Russia’s capital market in such an inhospitable institutional setting seems a less attractive idea currently (at the time of the Summit) than it did at the beginning of this process. If the above views have any merit, what are their implications for the development of a country such as Cuba? According to Reynolds (1983) Cuba started the process of intensive growth, where per capita income begins to increase systematically despite a positive rate of population growth, at the turn of this century. Since then the growth rate has exhibited considerable variations. Early in the century the country experienced the “vacas gordas” of the twenties and the “vacas flacas” of the thirties. Late in the century, the country has experienced the ups and downs of revolutionary growth, including the current “special period in time of peace.”10 Thus, Cuba is a developing country that has failed to increase consistently the material well being of the majority of its population during this century. We will justify this conclusion by pointing out how it relates to the characteristics of technological processes identified earlier. One of the main driving forces of innovative activities are the incentives provided by the temporary appropriation of monopoly rents that accompany economic innovation. Societies where improving the material well-being of the majority of their population is not an important outcome of their collective choice processes or goal of their leadership structures tend to create a variety of impediments to the appropriation of these monopoly rents and, thus, lower the incentives for innovative activities. In Cuba the present government does not even pay lip service to this goal of development through the provision of incentives in economic activities, perhaps due to their fear of the power that unaffected segmenst of the population could acquire as a result of successful entrepreneurship. For instance, their limits on self-employment activities, such as 12 chairs for restaurants, are grotesque from an economic point of view and lead to noncompliance. Similarly, workers in joint ventures get paid in pesos by the government at the official one peso to one U.S. dollar exchange rate while the government receives foreign currency for their wages from the foreign investors. With a black market rate of 1$ for 20 pesos, the disincentive effects for these workers to undertake initiatives within their organizations is strong. Of course, under the table payments mitigate the problem from the point of view of the enterprise. In both cases, however, a culture of corruption is created with negative externalities for society. In a relatively small country, which Cuba is, size can limit the development of horizontal innovations associated with the division of labor. One mechanism that allows small countries to avoid this limitation is openness or outward orientation. In Cuba, there are formal governmental restrictions on foreign investment, for example limits on the sectors open to joint ventures and on the selection of workers by these enterprises (they have to hire them through a government enterprise). In addition, there are informal restrictions associated with the corruption of a regime that requires the use of certain government enterprises controlled by Fidel Castro.11 Except for unusual circumstances, such as the Tran$card debit card mentioned earlier, this contributor to growth is seriously hampered. Hence, Cuba has to rely mainly on vertical or quality improvement innovations as a source of technological change. Research and development activities require human capital and physical capital. Cuba has invested an enormous amount in the education of its population during the Revolution. In terms of its endowment of human capital, it is in an enviable position among developing countries. It even exports human capital services to other countries (mainly in the form of dentists, doctors and teachers nowadays, and well trained soldiers in earlier decades). Indeed, some of them are going to countries that have substantially higher levels of material well being, for example Chile. Yet, the return to this educational investment has been recently evaluated as nil, Madrid-Aris (1997). Why? The ability to engage in learning by doing and participate in technological change processes is affected not only by the available stock of human capital but by the incentives provided for its application. In Cuba these incentives are lacking. For instance, there are anecdotes of female doctors in Cuba engaging in prostitution a couple of nights a week, because they earn a much higher standard of living in this activity than in their government paid jobs due to the distorted economy. More systematic evidence from UNESCO was recently reported by Montalván (1998): Namely, a decrease in secondary school enrollments from 89% to 75% and a decrease in University enrollments from 21% to 14%. Finally, human capital has several dimensions. Besides technical knowledge and skills there is also entrepreneurial knowledge and skills. This latter type of education has been nonexistent in Cuba until very recently. Indeed, the new programs in this area have been provided by foreign institutions. Whether it is in the adaptation of old designs or in the production of new designs, the institutions of a society play a critical role in providing an environment conducive to the development of technological change processes. Governments as part of this institutional matrix play an important role both directly, facilitating the transmission of knowledge, and indirectly, providing contract enforcement mechanisms that facilitate appropriability. Cuba’s government by its totalitarian nature acts as a hindrance in the performance of both functions. Ironically, its decay in terms of legitimacy and effectiveness and the availability of new technology has allowed a considerable increase in the amount of information available to the population, as a result of access to the Internet, and an increased ability to appropriate the benefits of private activities, due to the inability or unwillingness of the repressive apparatus to enforce restrictions. One wonders, however, about the ability of a new regime to perform the legitimate functions of government as a result of the attitudes generated by this one, especially considering that good government is not a home grown tradition in this century. Finally, an important factor that dissipates eventually the necessary monopoly rents associated with technological development and also spurs the continuation of the growth process is competition in innovative activities and in products. A necessary mechanism for small countries to ensure competition is openness of their economy. This mechanism is not available in Cuba. While some successful developing economies, such as South Korea, have had considerable government intervention in their participation in international trade, these interventions have had to satisfy eventually two hard budget constraints: their ability to export their products and the need to operate at an economic profit. Indeed, the current crisis in Korea may be due in no small amounts to the suddenness with which the soft credit constraint for favored enterprises was hardened by the international economy. Given the structure of the current Cuban economy, these constraints are considerably softer for the government- controlled enterprises where Castro is a major stakeholder and the result is unlikely to be long term development sustained by technological progress. With luck this socialist version of cronycapitalism may generate some growth, but it does not have a future as a source of development. 1. An earlier version of this paper was presented at the Eighth Annual Meetings of ASCE in Miami, August 1998. We would like to thank Ricardo Martínez and Francisco Rodríguez for insightful comments, while claiming responsibility for any errors. Betancourt would like to acknowledge summer support from the IRIS Center, under Cooperative Agreement No. DUR-0015-0031-00 with the U.S. Agency for International Development. 2. A similar argument would apply to China’s recent growth experience except that in the initial stages of that process an improvement in civic and political liberties accompanied economic liberalization. 3. Volatility is difficult to measure across countries in a reasonable manner when growth rates are unstable. 4. The authors also developed a more complex dynamic general equilibrium model which is calibrated to the Venezuelan economy and derive the same dynamic implications through simulation of this model. 5. See Debraj Ray (1998, Ch.5), for example, for a discussion of these issues from a modern perspective. 6. 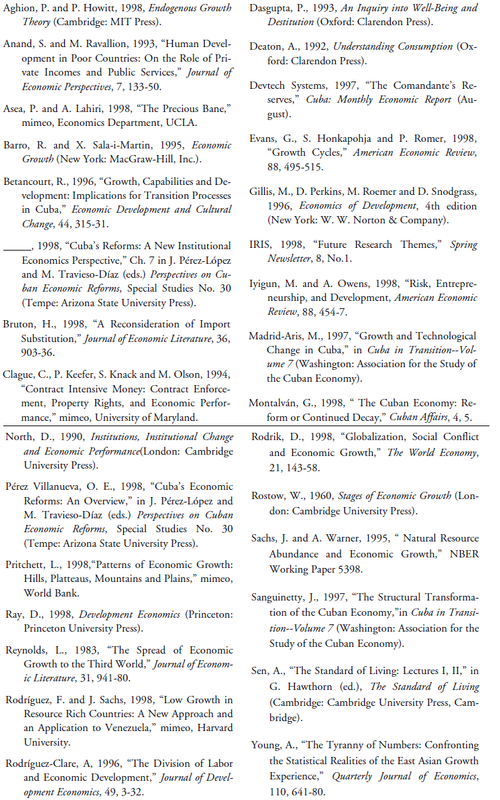 The April 1996 issue of the Journal of Development Economics is devoted to increasing returns models which highlight these features in a variety of contexts. 7. This influential piece on the empirical side of the literature shows that most of the recent and rapid growth in East Asia was due to the growth of labor and capital, including human capital, rather than to productivity improvements or technological change measured as a residual. 8. Incidentally, it was in the context of this type of distinction that Schumpeter argued in favor of innovations appearing in cycles and the recent literature is in the process of trying to formalize this idea in various ways. For example Aghion and Howitt (1998, Ch. 8) emphasize general purpose technologies, and Evans, Honkapohja and Romer (1998) emphasize expectations in the face of complementarity between the capital goods required by each producing sector. 9. Some stress the importance of entrepreneurial labor at some stages of development, e.g., Iyigun and Owen (1998). 10. A Cuban economist describes growth from 1972 to 1984 as having exhausted the Soviet model of socialist growth, the rectification process of 1984-1989 as a search for a Cuban national economic model, and 1990-1993 as a special period in time of peace or the first stage of management and adjustment to the crisis, Pérez Villanueva (1998). His estimate of the contraction in GDP during this last period is 33% of the 1990 level. 11. For an insightful account of this subsystem see “The Comandante’s Reserves,”Cuba: Monthly Economic Report (August 1997) or Sanguinetty (1997). Carlos Seiglie is Professor and Chair, Department of Economics, Rutgers University, Newark, New Jersey.